The Easter season is a time for rejoicing that Our Lord has shattered the bonds of death through his Resurrection. We celebrate his victory because it is our victory as well. He didn’t just shatter the bonds of death for himself, but for all of us. St. Peter in today’s First Reading proclaims to the astounded crowds at Pentecost that it was impossible for Christ to be held by the throes of death. Peter makes allusion to David because he is convincing his listeners through giving witness to Christ’s Resurrection that Our Lord is the Messiah. The real conquest of the Messiah is death. When the Lord promised David that one of his descendants would be the Messiah he said that descendant would reign forever (see 2 Samuel 7:12-13: “When your days are fulfilled and you lie down with your fathers, I will raise up your offspring after you, who shall come forth from your body, and I will establish his kingdom. He shall build a house for my name, and I will establish the throne of his kingdom for ever.”). The angel Gabriel told the same announcement to Mary: “He will be great, and will be called the Son of the Most High; and the Lord God will give to him the throne of his father David, and he will reign over the house of Jacob for ever; and of his kingdom there will be no end” (Luke 1:32–33). Our Lord was that descendant of David, the Messiah. It goes without saying that forever is a long time. Dynasties rise and fall, but David’s endures forever in Our Lord’s because it was impossible for Christ to be held by the throes of death: “God raised him up, releasing him from the throes of death.” Peter quotes Psalm 16 and attributes it to David (as the psalms traditionally are) as a prophecy that David knew death would be conquered for him too, through his descendant who would reign forever. In today’s Second Reading St. Peter reminds us that Our Lord’s blood paid the ransom for our life as well. Through his death and Resurrection the chains of our slavery have been shattered. When Peter speaks of the “futile conduct” handed on by our ancestors he is speaking of sin, including Original Sin, which in some mysterious way spreads to us all and separates us from God. Death came into the world due to sin, and even when we are ignorant of sin, death is a reminder of its presence and its evil. If death had the last world, everything we do in life is futile. Whether our achievements are noble or base, they’d come to nothing. Heaven doesn’t take Visa, MasterCard, or Bitcoin. There’s only one “currency” that grants us eternal life: the blood of Christ. We know that “currency” works because Christ was raised from the dead, and that encourages us to believe and to hope that if we sojourn in a way pleasing to Our Heavenly Father we too will be ransomed from death and our conduct will be worthwhile from here to eternity. 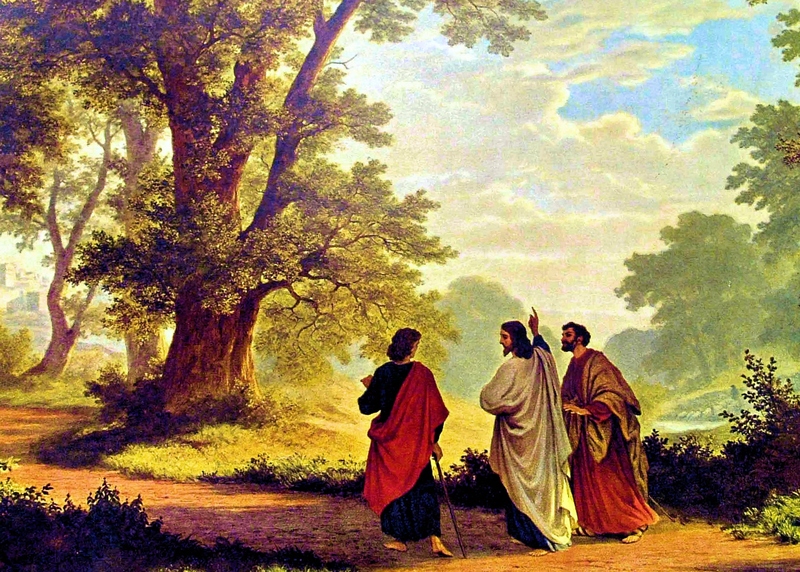 In today’s Gospel Our Lord helps two of his disciples on the road to Emmaus to see that their hopes were misplaced because they didn’t factor in the Resurrection properly. As far as they were concerned, Our Lord was dead. The Messiah was supposed to live forever, but he was dead, so Jesus was just another prophet. There’s a subtle difference between the vocation of the Messiah and the vocation of the prophet: the prophets spoke on behalf of God and performed signs to back it up, but, ultimately, they were rejected and killed. In the disciples’ mind, Jesus fit that pattern perfectly, as events revealed. 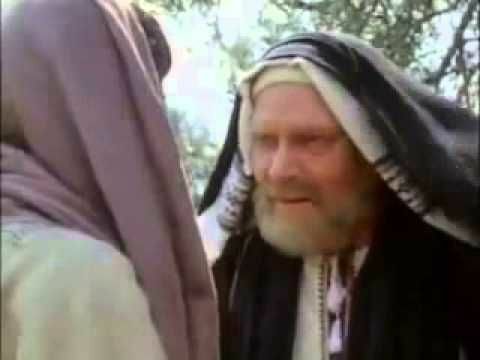 The Messiah would redeem Israel, and, apparently, Jesus didn’t do it: “…we were hoping that he would be the one to redeem Israel…” Yet they had some facts that they didn’t know how to process: women announcing that angels had announced that Jesus was alive, but their buddies finding only an empty tomb. Our Lord, with all the pastoral tact merited by the case replies, in so many words, “Duh!” He called them foolish and slow of heart to believe all that the prophets had spoken. He helped them connect the dots. The clincher was when he revealed who he was to them. They only saw a glimpse of him before he vanished, but that was enough. They ran back to their buddies to share the news and found out they’d had a visit too. Readings: Acts 2:14, 22–33; Psalm 16:1–2, 5, 7–11; 1 Peter 1:17–21; Luke 24:13–35. Nicodemus in today’s Gospel believes Our Lord is working signs that show his union with God, but he is far from the bold disciples exulting in the Holy Spirit in today’s First Reading after Peter and John gave witness to Jesus before the Sanhedrin. He comes at night not only to avoid being detected as a disciples, but because he is in the dark about the big picture: he’s not yet received the grace to fully understand Our Lord and his mission. Seeing the big picture is not just something to be worked out with the knowledge and reason at hand: it requires being born into a new life where the Holy Spirit helps you see. Our Lord today speaks of being born above, and of being born of water and the Spirit. If you want to see the Kingdom of God or enter it, this rebirth is necessary. We believe this happens through the grace that God gives via Baptism. It is not just water, and not just Spirit; both are needed. The sacraments are visible signs of invisible graces, instituted by Christ, and Baptism is the gateway to all others. The octave of Easter ended yesterday remembering Divine Mercy, but also those just baptized at the Easter Vigil. Let’s pray for all those recently born of water and the Spirit through Baptism. Readings: Acts 4:23–31; Psalm 2:1–9; John 3:1–8. 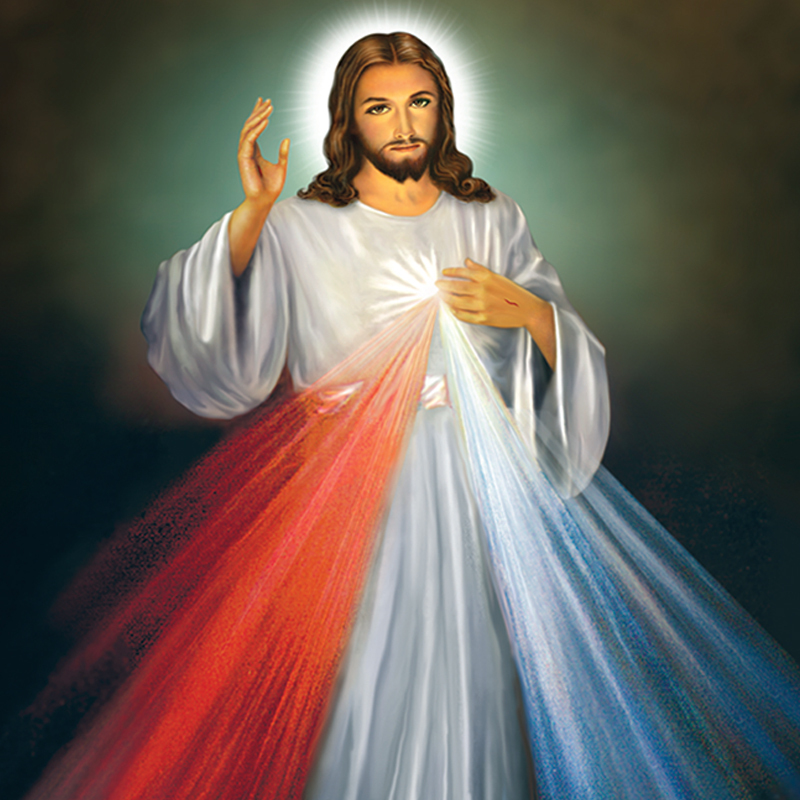 Today’s readings remind us why today, Divine Mercy Sunday, we’re celebrating the gift of Divine mercy. The Gospel takes us back to the evening of that first Easter Sunday. The disciples have gathered back together, but more out of fear than of faith: they had all abandoned Our Lord on the Cross. How could they expect mercy after what they’d done? In today’s First Reading we see the first heady days of a Christian community redeemed and reconciled through the grace of Christ. Long before apostasies, heresies, or schisms we see the first believers sharing their lives, their bread, and their prayers. We also see that the Apostles have a special role in the community: believers are devoted to their teaching. The faith, handed down by Christ to the Apostles, and then handed on through the centuries to us, continues to unite us. Those first believers didn’t believe in a vacuum: the Apostles showed many signs and wonders to bolster their faith. Even today when Christians live in harmony, not only with fellow believers, but with their fellow man, they are a sign and a wonder of the reconciling power of Christ. Lumen Gentium teaches that the Church is called to be a sign and instrument of “both of a very closely knit union with God and of the unity of the whole human race” (n.1). The believers didn’t do it alone, and neither do we. Our Lord has given us sacred ministers to help us live in harmony, and one way they do so is through the sacrament of Reconciliation. In today’s Second Reading St. Peter reminds us that the great mercy of God is what gives birth to a new hope in us. The Resurrection itself is a sign of the mercy of God. Our hope is alive because Christ was raised from the dead. Before his Resurrection the sins of mankind, from Adam on down, lead to one dire conclusion: death and eternal separation from God. In Christ’s Resurrection we have a living hope that through his mercy death will not have the last word in our lives. We too will inherit the eternal life that he won for us on the Cross. However, this “inheritance” is not automatic. Through trials and our efforts at purification we show that we truly desire the gift of his mercy. Despite Our Lord’s victory we stumble or fall repeatedly, which is why we need his mercy repeatedly. In today’s Gospel Our Lord shows that he has a special mission for his Apostles: to be the instruments and channels of that mercy for the whole world, through the sacrament of Confession. The Apostles need to be reconciled with the Lord they’d abandoned when he needed them most. Jesus tells them twice, “Peace be with you.” He shows them his hands and feet so that they can see the wounds and know it’s not a dream or an illusion, and the fact that they abandoned him for was not a dream or illusion either: The sin really happened, the price really had to be paid for that sin, He paid the price in full. With the words “Peace be with you,” He says what’s past is past. This reconciliation is meant to be maintained and to spread. Our Lord breathes on the apostles and says, “Receive the Holy Spirit. Whose sins you forgive are forgiven them, and whose sins you retain are retained.” This power comes from Christ through the Apostles, and through the bishops and priests that came after them, through the Sacrament of Confession. When Jesus says “Peace be with you” twice in this passage he is showing us that forgiveness is not a one shot deal, or else Baptism would be enough: we’re always in need of his mercy, because we continue to battle with our sins. When we examine our lives, we always see moments where we could have done more and better, and Confession gives us the peace and grace to keep trying to do more and better. We spend so much time getting check-ups, watching what we eat, trying to get some exercise, because we’re concerned for our health. All those things are important, but our spiritual health is important as well. Sin is something we struggle with throughout our earthly lives. You should be worried if you think you don’t have any faults or failings that you should work on. Take some time to do a spiritual “check-up”: read Part 3 of the Catechism of the Catholic Church. Don’t just skim it; read it, and see whether your life and the life in Christ that it presents matches. Confessors are standing by. Readings: Acts 2:42–47; Psalm 118:2–4, 13–15, 22–24; 1 Peter 1:3–9; John 20:19–31. Today we consider the mystery at the heart of the Christian faith. It is simple, but extraordinary and powerful. It was so mind-blowing that even the disciples and the apostles Jesus told it would happen didn’t believe it until they saw him. It shattered all their concepts of life. In the whole history of humanity death was the greatest fear, the curse to wish or inflict on your worst enemies. It was conquered. “Christ is Risen” says it all. We can no longer live the same way now that death has been defeated in Christ. In today’s First Reading St. Peter reminds us that the Risen Christ only revealed himself to those who believed in him. Only those who believed in him were then blessed by meeting and eating and drinking with the Risen Lord. He reminds us that “everyone who believes in him will receive forgiveness of sins through his name”: on the day of our Baptism we had an encounter with the Risen Lord that transformed us into children pleasing to Our Heavenly Father, and he continues to reveal himself to those who believe in him. An encounter with the Risen Christ in faith is always a salvific and transforming experience. In today’s Second Reading St. Paul reminds us that an outlook of faith keeps our eyes fixed on the things of above. When we gaze above in faith we know the Risen Christ stands at the right hand of His Father and intercedes for us. If we don’t see him it is because our faith is not strong enough and we need to beg for more. Pope Francis describes a certain class of Christians in Evangelii Gaudium who seem to live a permanent Lent: they have not had an experience of the Lord and his love, and, therefore, the Gospel brings them no joy. The Resurrection banishes vanity from our lives and changes our perspective. In today’s Gospel we see that the Resurrection didn’t sink in for the disciples until they witnessed the results themselves. It leaves us in hopeful suspense because death no longer had the last word. The disciples had all the facts. Christ could raise the dead. 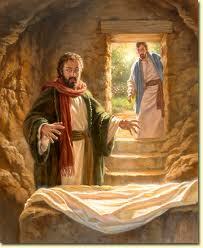 Martha saw his brother Lazarus raised after three days in the tomb. The mourners of the dead little girl’s daughter mocked Jesus when he said she was sleeping, and then he “woke” her up. Even Mary thought today that the body had been stolen. The disciples walking to Emmaus had all the facts. After the Transfiguration he told Peter not to tell anyone until he was raised from the dead, and kept repeating that he would be raised from the dead on the third day. The disciples were clueless. We can’t blame them. Even today there are a lot of disciples of Christ who are clueless. All the facts are at hand, but they lack faith and so they live as if eternal life is a faery tale. We have many more signs that they did: the Church has testified to the Resurrection for over two thousand years, and many of her children have gone to the grave believing that someday they would rise, just as Our Lord did. Like John in today’s Gospel let’s look at the signs of Jesus’ resurrection–an empty tomb, a suspiciously well-folded head wrapping–and simply believe. Readings: Acts 10:34a, 37–43; Psalm 118:24; Psalm 118:1–2, 16–17, 22–23; Colossians 3:1–4; 1 Corinthians 5:7b–8a; John 20:1–9. See also Easter Sunday, Mass During the Day and Easter Sunday, Mass During the Day (2). This evening we begin the Easter season by celebrating the gift of new life in Christ. Our Lord lives anew, and, like the candles lit one by one from the blessed Paschal flame in today’s liturgy, that new life reaches each of us, one by one. The candles we bear in this ceremony remind us of that day when someone handed a lit candle to our godparent and said, on our behalf, “receive the light of Christ.” This evening throughout the world catechumens receive the sacraments of Christian Initiation–Baptism, the Eucharist, and Confirmation–and receive new life in Christ as they come fully into the Church. This evening is a reminder and a renewal of our new life in Christ as well. 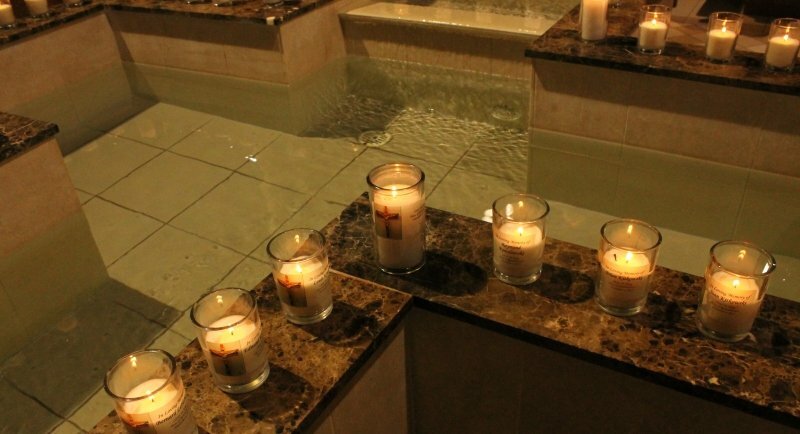 Whether our celebration of the Easter Vigil includes catechumens or not, we renew our baptismal promises and receive a blessing with holy water to remind us of the blessing of new life in Christ that came to us through the waters of Baptism. These promises remind us how we are to best live the new life Our Lord has given us: we renounce Satan, all his works, and all his empty show; and we renew the basics of our faith that we recall every time we pray the Creed. Let’s pray for those coming fully into Church communion this evening, and pray that we be renewed in our desire to live well the new life in Christ that we have received. Christ has risen. Readings: Matthew 28:1–10. See also Easter Vigil, Cycle C and Easter Vigil.